Buffy comic fans rejoice! It looks like the Buffy the Vampire Slayer Season 8 comic is getting made into a motion comic. If you are wondering what the hell a motion comic is let me fill you in; motion comics look like traditional comic books but they have voice acting and a musical score. They only have certain elements of the comic page animated: a zoom-in, a pan, someone raising their armsâ¦etc. So itâs pretty much someone filming the pages of the comic while a voice actor reads it to you. And itâs this motion comic deal that is happening with the Buffy comic. If you donât know about the Buffy comic itself, itâs a comic written by our beloved Joss Whedon and it picks up where the show left off. Hereâs a memory boost: the show ended with Buffy and the Scoobies saving the world again and having Sunnydale turn into a crater as a result. 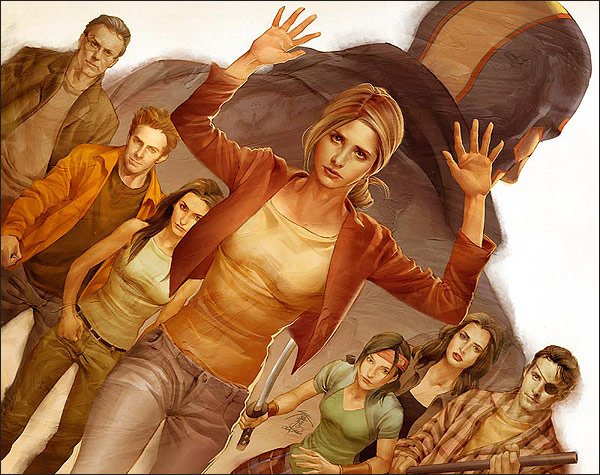 The Buffy comic is about Buffy and her army of Slayers saving the world from new evils. There isnât much known on this new comic web series, but what we do know is that casting director Jeff Shuter is looking for voice actors to play the parts of familiar Buffyverse characters like Faith, Kennedy and Robin Wood, as well as a bunch of new characters. Buffy wasnât on the list of casting calls, but that could mean that they have already cast her.